It was never a good idea to tune in to the Ghost story programmes on the Chinese Radio stations at night. 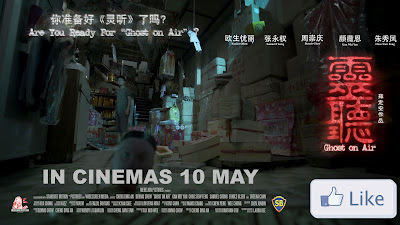 'Ghost on Air' the latest movie by Cheng Ding An will tell you why. Come find out more about this new movie at 'Ghost on Air Production Talk', an event jointly organised by Merelion Pictures and Singapore Media Academy to shed light on the inspiration and production values behind the upcoming local horror movie. A ghost story DJ is haunted by the very stories he is telling... Will he find the truth about the hauntings before it is too late? Join us for a production sharing session from the film-makers behind Ghost on Air, a new film starring local DJ, Dennis Chew. Find out the inspiration behind the movie and hear exclusive behind-the-scenes anecdotes about the production from director, Cheng Ding An. This production talk is jointly organised by Merelion Pictures and Singapore Media Academy. Ghost on Air opens 17 May 2012.